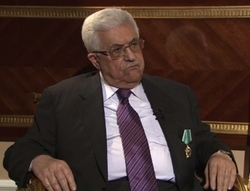 Mahmoud Abbas interviewed today on RT. RT: Today, the other part of the Palestinian resistance, Hamas, is increasingly leaning towards a political solution of the problem rather than a military one. Have you noticed the shift? RT: The EU is said to be considering a move to take Hamas off the list of terrorist organizations. Do you think that this may be an attempt to legitimize the Hamas-led government? MA: I don't think so. After the recent developments, the chances are quite high that the Hamas government may be recognized as legitimate. If Hamas is committed to the ceasefire and if it openly pledges to stick to the peaceful popular resistance, I don't see much difference between their policy and ours. In this case, there is no need to label them as a terrorist organization. RT: But you didn't target Israel with rockets…. MA: Neither we nor Hamas did. Not any longer. After the Second Intifada, we decided to give up on armed resistance. And let me be totally frank with you: we don't want to launch any armed resistance whatsoever. Hamas has said the same. Yes, there were clashes in the past, but they have stopped – and I'm grateful to Allah for that. Of course, in each of the three bolded statements, Abbas stressed that Hamas has adopted Fatah's non-violent approach, and not the reverse. But for anyone with eyes to see, this is clearly false. Even the interviewer points out that Hamas keeps attacking Israel with rockets, a fact that Abbas baldly denies.